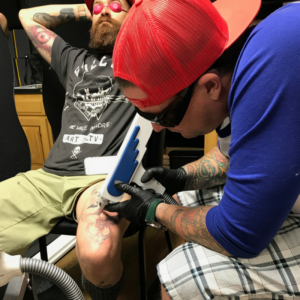 Welcome to Story Of My Life’s detailed overview of tattoo removal in Fort Collins, CO! 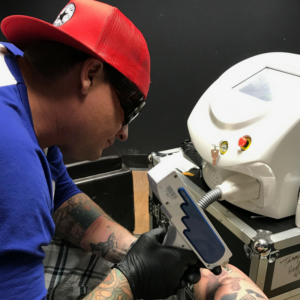 Our laser tattoo removal services offer individuals the unique opportunity to remove a tattoo that at one point in time seemed like a great idea. Laser tattoo removal is an investment, taking time and commitment from the individuals who receive the service. Our team of educated and friendly staff are dedicated to each client and very passionate about body art. Our mission is to help you leave our facility feeling more confident in your skin than when you first walked in. Our Janssen laser is trusted by leading tattoo removal service providers around the world and is trusted to eliminate the most ink in the shortest amount of time; resulting in money saved and less treatments needed. Laser tattoo removal technology has greatly improved over the past fifteen years. Even though there have been significant improvements in the ability to remove tattoos, there are still several contributing factors that affect the success of tattoo removal. 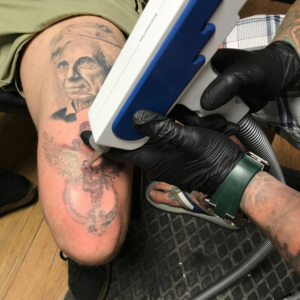 Ink color, color quality, tattoo location, age of the tattoo, and even sun exposure can all influence the tattoo removal process. After a series of a removal treatments, the ink particles in the skin will be broken down and flushed out of the body until no ink is visible in your skin. Remember that every client’s tattoo will fade differently. Clients with a healthier immune system are more likely to experience faster fading; so be sure to drink plenty of water and maintain a healthy lifestyle for better results. Below is a list of the most frequently asked laser tattoo removal questions. If your question is not listed below, please feel contact one of our expert laser technicians and they will be able to assist you. Every tattoo is different and every client heals in different way. It’s impossible to assign a set number of treatments that you will need without first assessing your tattoo in person. Typically, clients will need between 5 to 10 treatments before seeing complete removal. However, patients with older or more faded tattoos may only need 3 to 4 treatments. During your free consultation, one of our expert staff members will use a variety of factors to best estimate the number of treatments you will need to achieve complete ink removal. These factors include the age, size and location of the tattoo; including the depth and density of the ink, and also if there are any pre-existent scarring. You must also take your health into consideration as well. The pain tolerance levels of individuals varies greatly depending on the person. You may experience slight discomfort; however, the overall treatment is fairly tolerable. The post-treatment sensation has often been compared to having a rubber band snapped against the skin or getting the tattoo itself. Fortunately, laser tattoo removal is a very quick procedure that lasts anywhere from 1 to 30 minutes depending on the size of the tattoo being removed. Laser tattoo removal is the safest and most effective non-invasive method for removing and unwanted tattoo. The most common side effects of treatment are redness, swelling, blistering, scabbing and lightening or darkening of the skin in the removal area. These side effects are temporary and will heal over several weeks following your treatment. Blisters and scabs should be covered at all times and not intentionally irritated in any way during the healing process. Doing so can lead to more serious side effects like scarring. If client’s follow proper aftercare instructions the skin should heal very well. Whether you want to completely remove your tattoo, just a portion, or you just want to fade an existing tattoo for a cover-up purposes, we can deliver. Cover-up tattoos usually require a great deal of ink to completely conceal them; especially any that contain dark ink. Fading a tattoo will give the artist a cleaner canvas and more flexibility with the intended design. Tattoo removal aftercare instructions are the most important steps in making sure that your skin recovers well; yielding the best results. Proper aftercare helps prevent infection and unwanted side effects from occurring. Keep the area dry and clean after each treatment. Gently wash the treatment area with soap and water, then pat to dry. Apply a thin layer of antibiotic ointment to the area 3 times a day and cover with a sterile bandage. Repeat these steps for the 3 days following a treatment. Do NOT interfere with any blisters or scabs that form during the healing process. Blisters and scabs are very common and although unsightly, are positive signs that your body removing the ink properly. Meddling with any scabs or blisters can increase chances of infection or permanent damage to the skin. Allow any scabs or blisters to dissolve in their own time. Once this happens, apply an antibiotic ointment to the treated area for at least the next 24 hours. Avoid any soaking of the treated area. Showers may be taken as long as high-pressure water is not directly hitting the treatment site. Patients should avoid baths, swimming pools, hot tubs and any other water soaking activities to avoid infection. Patients may experience itchiness or discomfort. Moisturizers such as Aquaphor or Vitamin E ointment can be applied to relieve itchiness. Patients may take Tylenol for inflammation or discomfort but should avoid taking Aspirin as this can increase risks of bruising and/or bleeding. Avoid direct sun exposure and tanning. Excessive sun exposure can increase the risk of pigmentation changes. Wear appropriate clothing and apply a sunblock of SPF 30 or higher to the treatment site once it has completely healed. If you experience any unusual side effects, please contact us immediately. Exercising immediately BEFORE your laser tattoo removal treatment is no problem and recommended. Exercising after treatment is not recommended at the risk of inducing or increasing any swelling. For larger tattoos and tattoos on extremities, avoid exercising for at least 48 hours or until swelling and tenderness in the area has subsided. Be mindful that exercise includes activities that involve a lot of movement of the extremities like walking, and running or playing with your kids to the park. Just think of it as a guilt-free day of taking it easy! Once the swelling has subsided we strongly urge you to exercise. Stimulating blood flow to the treated area can speed up the process by flushing out those unwanted ink particles! Sun exposure affects laser tattoo removal because of how it affects the pigment in your skin. Melanin is the pigment in your skin that determines your skin, hair, and even eye color. The more your skin is exposed to sunlight, the more melanin is produced. This is how your skin can tan or burn. If your skin is severely tanned or burned, it can be harder to remove a tattoo because the skin is more vulnerable and it is harder for the laser to break up the ink particles in the tattoo. Laser tattoo removal is still effective on tanned skin. In short, YES! You can also go in the sun after a treatment once the swelling and redness subside. But it is highly recommended to use SPF 30+ on and around the area being treated. 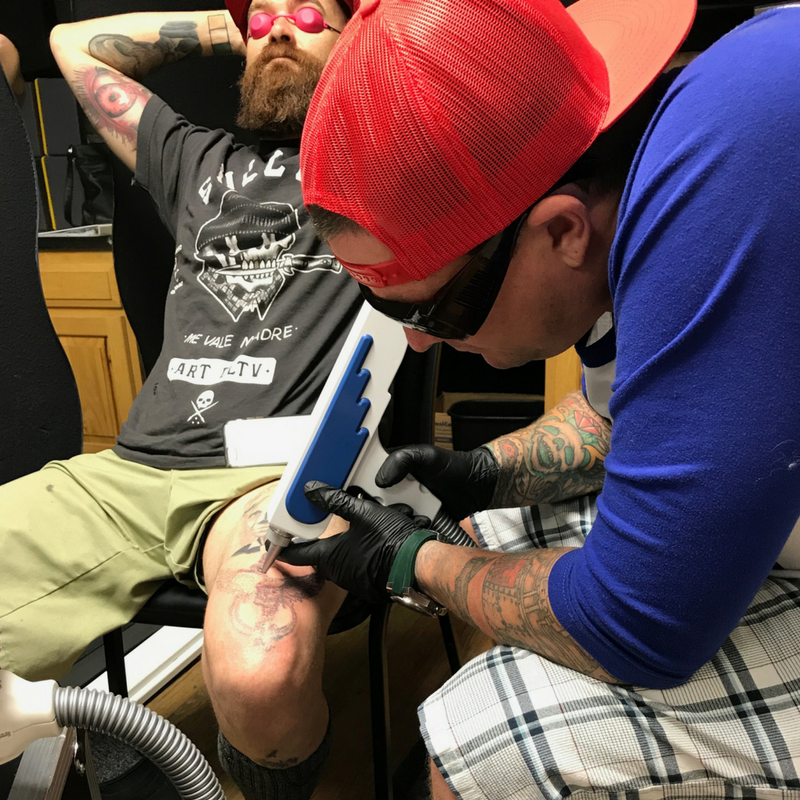 If you would like to have a consultation about Tattoo Removal in Fort Collins, CO, please fill out the form below and we will get back with you shortly!